This is the first in a series of Monday entries I'm going to publish over the upcoming weeks in which I outline some of the reasons we decided to pursue a new user interface for Office 12. 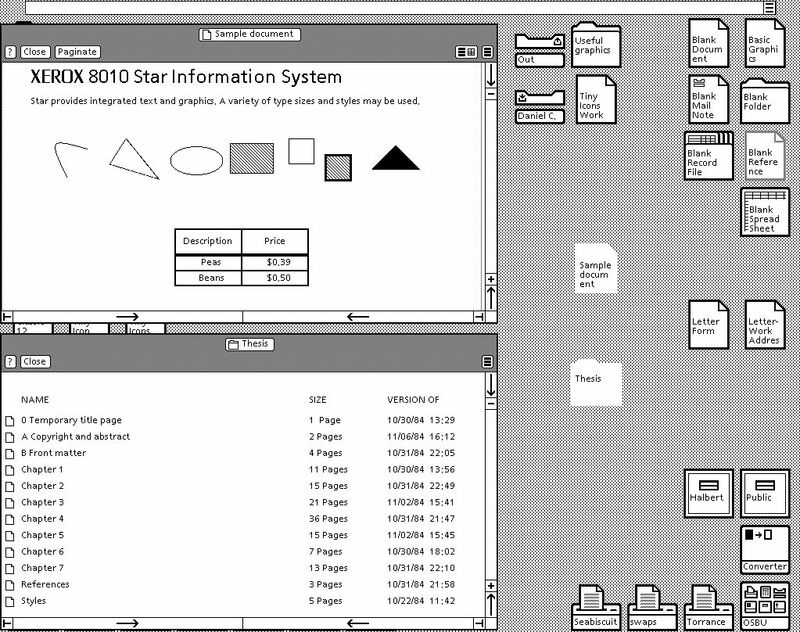 The Star was not a commercial success, and today many technology historians point out that Xerox did not do very much to protect the intellectual property they created. 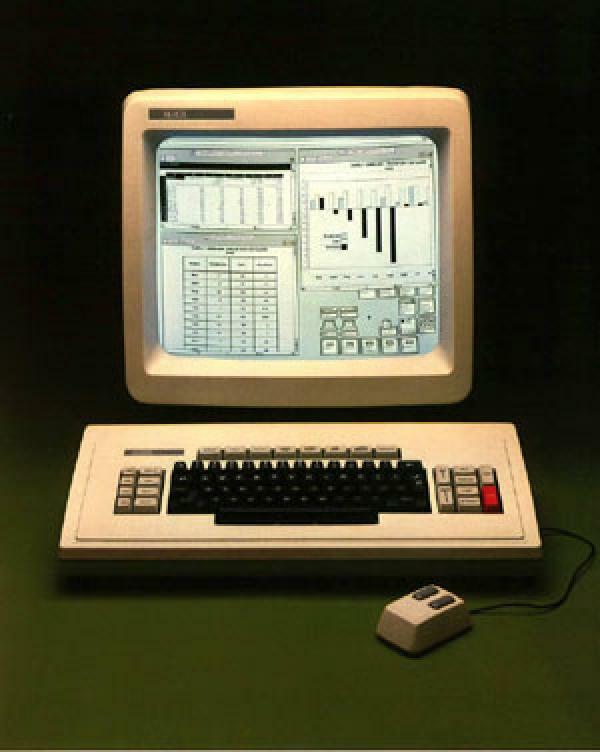 As a result, most people today think of Xerox as just a copier company despite the essential role PARC played in incubating the modern user interface. Many of the influential contributors to the ideas behind the Star found their way to other companies, notably Microsoft and Apple. Apple was first to borrow and expand upon the ideas of the Star, first in the failed high-end Lisa system and then later in the Macintosh. Lisa standardized a number of designs that are still used in many modern user interfaces: the top-level menu bar, the concept of checking selected menu items and graying out those that are disabled. (The changes weren't all good--some PARC ideas abandoned by Apple, such as proportional scroll bars, didn't make their way back into the mainstream until Windows 95.) If you're interested in a more detailed history with screenshots, Jeremy Reimer has an interesting site. The Macintosh went on to to inherit much from the Star and Lisa and, of course, the Mac brand name carries on today. Microsoft worked with early Apple prototypes to develop Word 1.0, which shipped in 1984 with the original Mac. Multiplan and Chart were also under development for the 512K Mac, and they eventually shipped together in 1985 as Microsoft Excel 1.0: the first blockbuster retail program available for the Macintosh (and the stated reason many people purchased early Macs.) Here you can see pictures of early Microsoft productivity apps in Apple advertising from 1984. Thus, the roots of the early Microsoft Office programs were rooted in the Mac and of course, the user interface reflected that. As the Mac's first and biggest provider of software (a title Microsoft still holds today), some of the UI decisions made in the original Macintosh were influenced by the needs of Microsoft's development teams. While the extent to which it is admitted this happened varies widely depending on the personal account, it is safe to say that the programs were developed with an intimate understanding of the system and vice versa. Certainly, the basic outline of Office's graphical user interface (especially the use of a top-level menu bar) has its roots in that first Macintosh version. Next Monday, we visit "Ye Olde Museum of Office Past" and look at Word for Windows through the ages. One UI that is still considered by many to be very easy to use and that has been around for a long time is (formerly) Acorn’s RISC OS, now developed by RISC OS Ltd. I always wondered whether Microsoft (and others) ever had a suite of machines running alternative OSes to look at other approaches to GUI design. Certainly as your article indicates many ideas have been shared and built upon by different OS/GUI suppliers – which is a good thing. Long ago, I got certified as a Xerox Star operator at Boeing. This helped me use the machine to finally complete my Masters thesis five years after leaving college. It is ironic that Xerox managed to give away so many ideas while selling the Star at about $70,000 a station. Not many customers for a proprietary fancy word processor at that price point! I remember using Sibelius on Acorn in my college years before they finally gave up and ported it to Windows/Mac. We also used NEXTSTEP black hardware and Be boxes. I guess I’d recommend anyone who wants a future in interface design to get a music composition degree–you definitely use your share of exotic hardware and software. Keep in mind that the cost of the original GUI machines were not based on greed, they were based on the fact that the parts needed were not widely available, if available at all. EX: If graphics were bleeding edge, Xerox might have had to create their own graphics cards, or pay another company prime to make cards for them. I wouldn’t be so quick to think Xerox dropped the ball as to think that they were a victum of excessive prices because the parts could not be had cheaply. Of course companies now-a-days realize sometimes they have to bite the bullet and take a loss when there is a longterm profit to be had (video game systems have been doing this for 2 decades now, Microsoft realized that before they got into the Xbox). I’ve always heard it said that the Alto only had tiled windows and not overlapping windows. When the people from Apple saw the system they thought that they’d seen overlapping windows and when on to figure out how to implement them in the Lisa, which surprised the PARC people because PARC hadn’t done it that way. Is this folklore? "Apple was first to borrow and expand upon the ideas of the Star"
In fact, Apple paid Xerox in Apple stock for the use of the GUI IP, so they were paying rather than borrowing. I only mention this because it is so often misreported that Apple ‘stole’ the ideas from PARC. "I’ve always heard it said that the Alto only had tiled windows and not overlapping windows. When the people from Apple saw the system they thought that they’d seen overlapping windows and when on to figure out how to implement them in the Lisa, which surprised the PARC people because PARC hadn’t done it that way. Is this folklore?" The Alto had overlapping windows. What it didn’t have that Apple engineer Bill Atkinson *thought* he saw, was the ability to redraw portions of partially-obscured windows when a new window was brought to the front, or moved. Bill invented this technique, called "regions", and it remains in use to this day. The confusion about overlapping versus tiled comes about because the Star (released after the Alto) abandoned overlapping windows in favor of tiled windows because it was thought to be easier for the user to understand. The system was still capable of overlapping, however, as you could see whenever dialog boxes came up. As far as I’ve read you are correct, the PARC did not have overlapping windows, they could tile. And back on the original blog post, I should point out inactive windows on the PARC not redrawing is a good thing, no sense in wasting precious CPU or graphic cycles on windows that aren’t important, this is a luxury only post 1980 cpus could afford. Although in a tile windowed enviroment the non-updating windows is right in your face, instead of hidden "behind the scenes". It’s also true that Windows 1.0 only had tiled windows for the same reason–it was thought that it would be easier for the user to understand. Overlapped windows because the a top feature request, of course, and that was added in Windows 2.0. Totally agree that not painting inactive windows might have been a good thing on that early hardware. I was mostly trying to point out that there are nuances of the design you don’t get just from seeing a screenshot. "Any discussion about the user interface of computers today has to start all the way back at the Xerox Palo Alto Research Center (PARC) in the 1970s." Though strictly speaking, I think you are referring to GUI and not UI – most machines have UI’s, otherwise, how could a user and machine interact? Even the command line is a user interface. "It’s also true that Windows 1.0 only had tiled windows for the same reason–it was thought that it would be easier for the user to understand. " While this may be partly true, most believe that Windows 1.0 didn’t tile its windows so as not to step on the original MacOS’ toes. 🙂 It didn’t matter; Apple went on and sued Microsoft anyway.